Looking forward to the year ahead, as we all tend to do at this time, I notice that not only is this the “year of the snake” and the year of the (Pantone) color emerald green, but also a year in which there will be two great comets visible in the northern hemisphere. 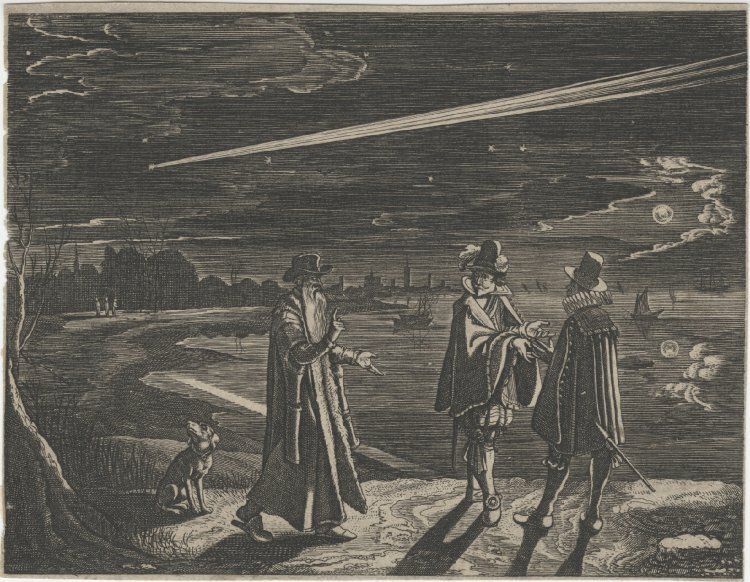 I’m working on an academic project on changing perceptions of wonder in the early modern era, and few things were as wonderful as a truly “Great Comet” blazing a very visible trail through the sky, so this is one of those times where past and present, scholarship and blog intersect, which is very exciting. It’s a rare year that one comet is visible to the naked eye, so the possibility of two is extraordinary. Comet PANSTARRS will be the first comet of 2013, appearing only in the southern hemisphere for the first two months of the year, but by the middle of March it should be visible in the north. The recently-discovered Comet ISON, so bright that it might even be visible at daylight if it doesn’t break apart or flame out, will make its appearance towards the end of the year. Both before and after the sixteenth century, comets were portents of a potentially cataclysmic event or great change: plague, earthquake, the fall of a regime, all of course the wrath of God bearing down on sinful people. Omens were always ominous. 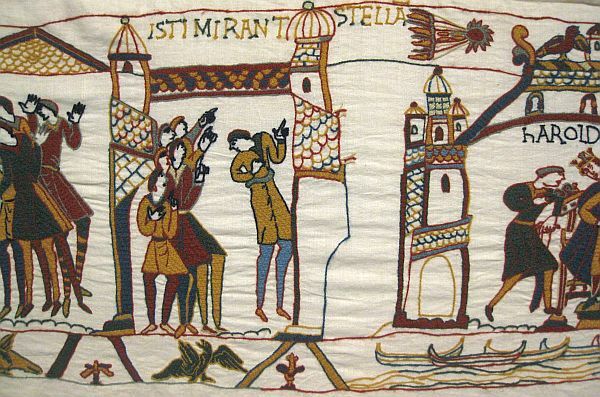 In political terms, comets were “the terror of kings”, and one of the first images of a comet, likely Halley’s comet, is in the eleventh-century Bayeux Tapestry, which records the Norman Conquest from the Norman point of view. Isti mirant stella: they gaze in wonder at the star, blazing over King Harold II’s head, foretelling his defeat and death. Halley’s Comet did not return until 1456 (when it was associated with the conquests of the Ottoman Turks in eastern Europe), but there were bright “hairy” stars recorded by European chroniclers in 1264 (predicting the death of Pope Urban IV) and 1402 (again–the advances of the Turks). 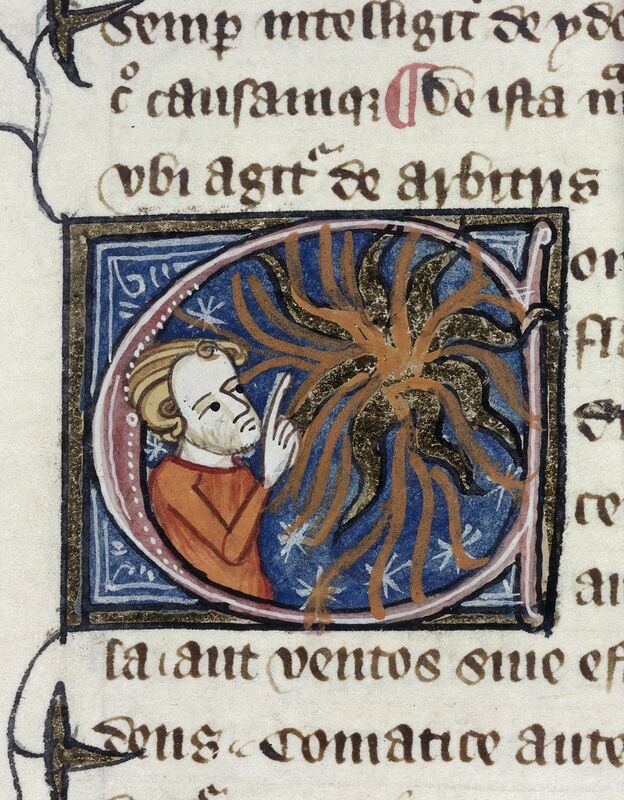 The first image below, from a fourteenth-century illuminated manuscript, shows a man looking upon a particularly bright (and hairy) comet with wonder, a mixture of fear, awe, and curiosity, and I think that balance tips towards the latter in the early modern era. As evidence, look at the amazing second image below, of what I often describe in class as a “comet party” viewing (and drawing) the Great Comet of 1577: these people are not quaking in fear; to the contrary, they look rather celebratory. British Library MS Royal 6 E VI, c. 1360-75, England; Woodcut by Jiri Daschitzsky, Von einem Schrecklichen und Wunderbahrlichen Cometen so sich den Dienstag nach Martini M. D. Lxxvij. Jahrs am Himmel erzeiget hat (Prague: Petrus Codicillus a Tulechova, 1577). The changing perception of comets isn’t quite as straightforward as these two images indicate; in fact, early modern descriptions and representations of comets are a mixed bag, some very “scientific”, others very allegorical. Below, two sixteenth-century men of science depict comets of their time in very different ways: while Peter Apian attempts to chart the course of the comet of 1532, physician Ambroise Paré presents blazing stars as fearful “swords of the heavens”, like the “mortal darts” of John Milton’s Paradise Lost a century later: Incensed with indignation, Satan stood Unterrified, and like a comet burned, That fires the length of Ophiuchus huge In th’ arctic sky, and from his horrid hair Shakes pestilence and war. 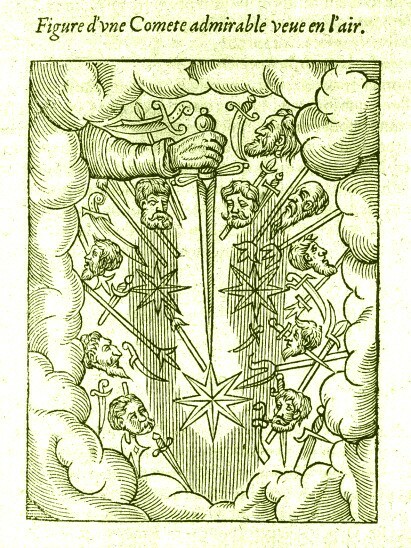 The comets of Peter Apian (1532) and Amboise Paré (1579), Wellcome Library, London. 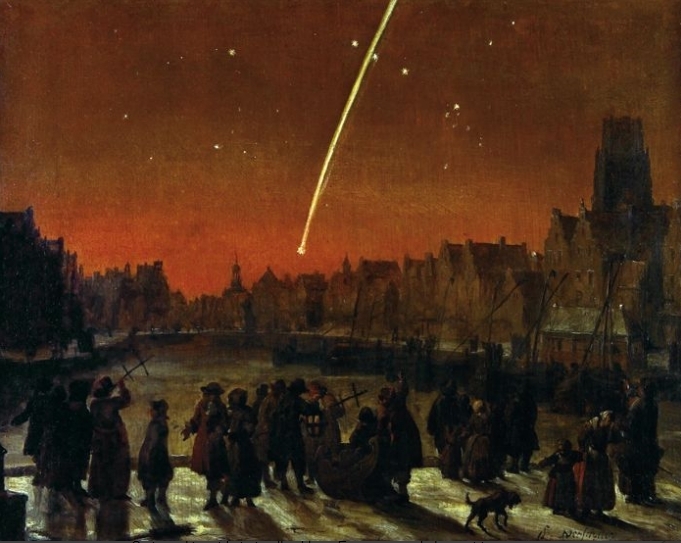 Engraving of the Comet of 1619 after Adriaen van de Venne, British Museum; The Great Comet over Rotterdam, December 26, 1680 by Lieve Verschuier, Historisch Museum, Amersterdam (note the crowd below with their measuring devices). In the eighteenth and nineteenth centuries, especially after Halley was proven posthumously correct with the return of “his” comet in 1758, comets were perceived with a more modern sense of wonder on the part of both the scientific community and the general public. The blazing comet of 1811 inspired all sorts of cultural expressions, and was tied to a positive outcome (for once): a conspicuously good year for wine production. 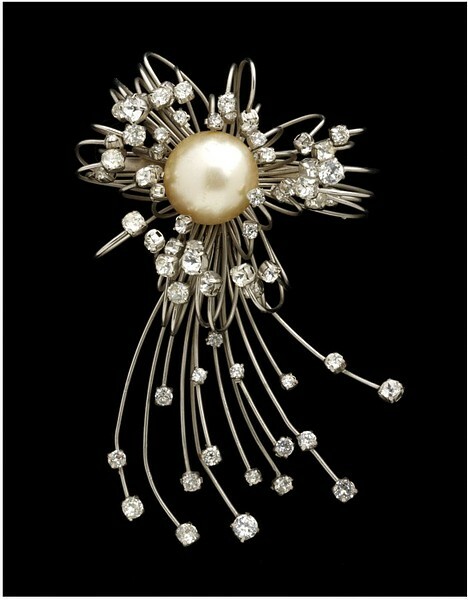 And even better than wine (or at least on a par), the return of Halley’s comet in 1835 inspired a completely new category of jewelry: comet pins. 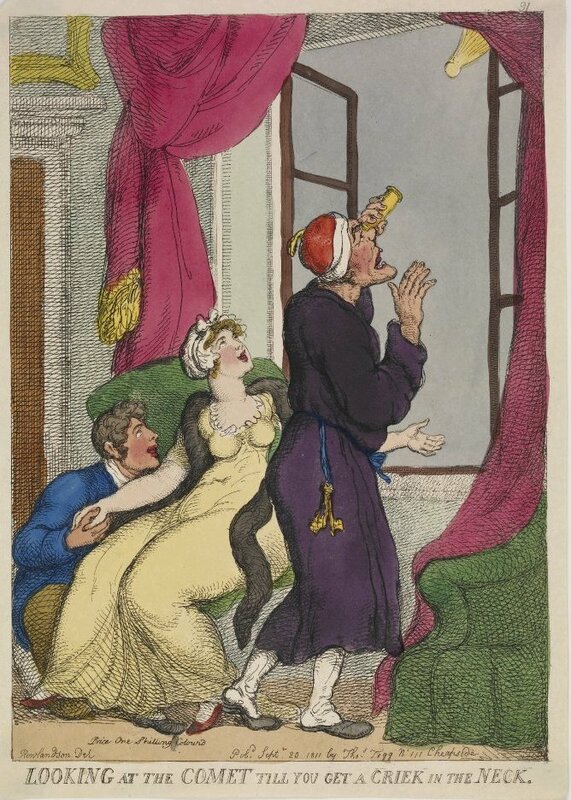 Thomas Rowlandson’s caricature of comet-viewing in 1811, British Museum; French paste comet brooch, c. 1950, Victoria & Albert Museum, London.